Mud like this made land travel to the lines impossible. 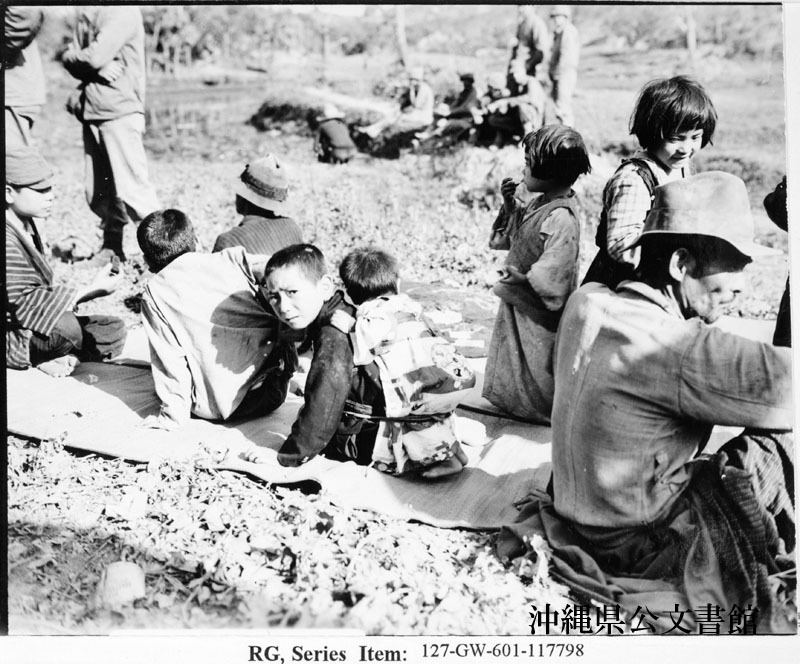 Supplies had to be carried or flown to the front. 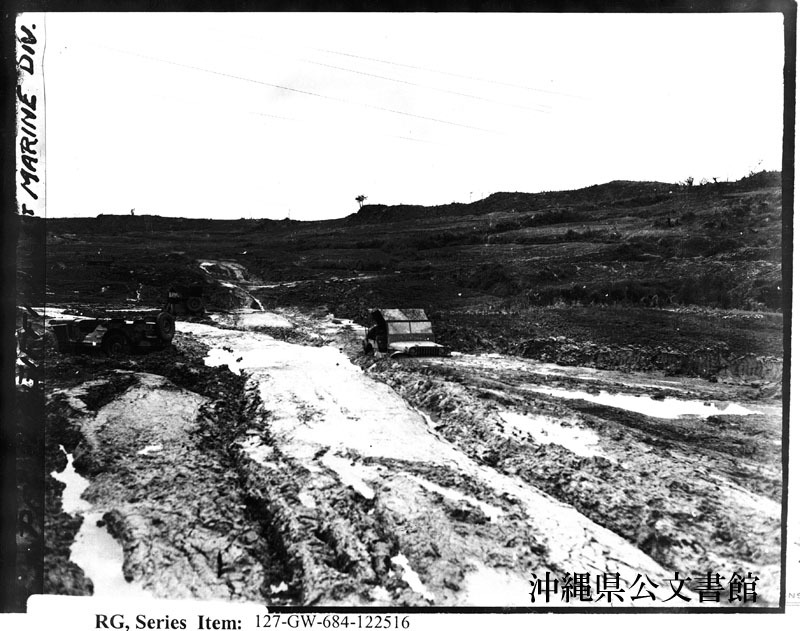 Mud like this stopped all land travel and brought air-planes into use in supplying our troops at the front. 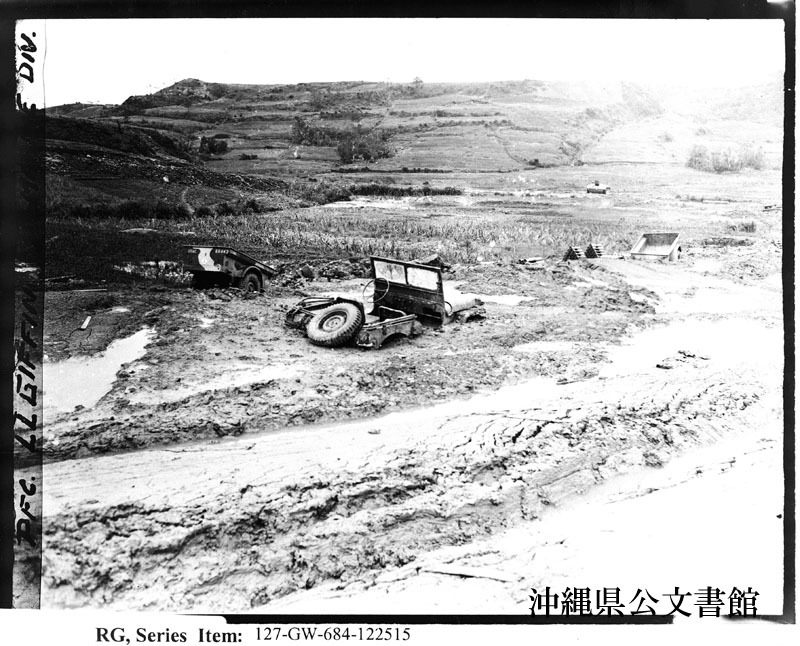 Mud heaped more hardship on the Marines by cutting off much need for food, water, and ammo. 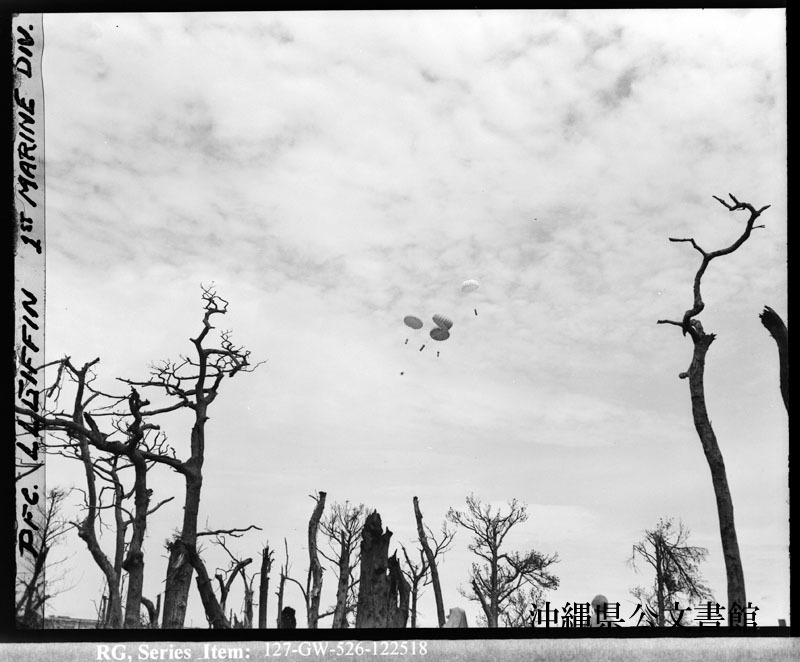 Four parachutes drift to earth with much needed supplies for troops in shore area after land routes were made impossible by long rains. 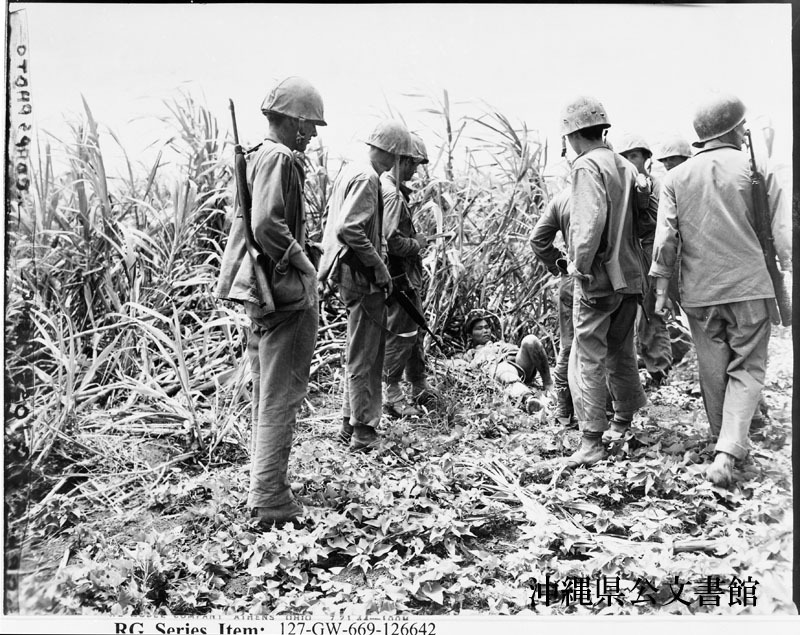 Fresh troops move in on the drill field in front of Jap Barracks while Marines in Background gather up food, water, medicine and ammo which has just been parachuted from T.B.F's. CASTLE WALLS--Rubble of the walls of Shuri castle below which lies the moat. 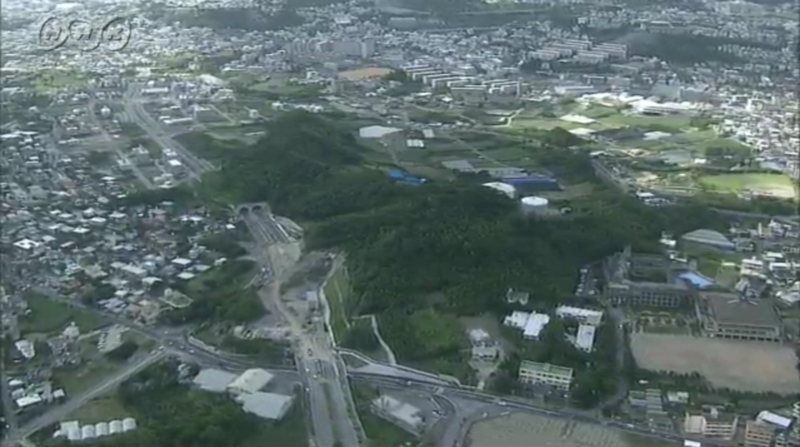 In background is Shuri city. 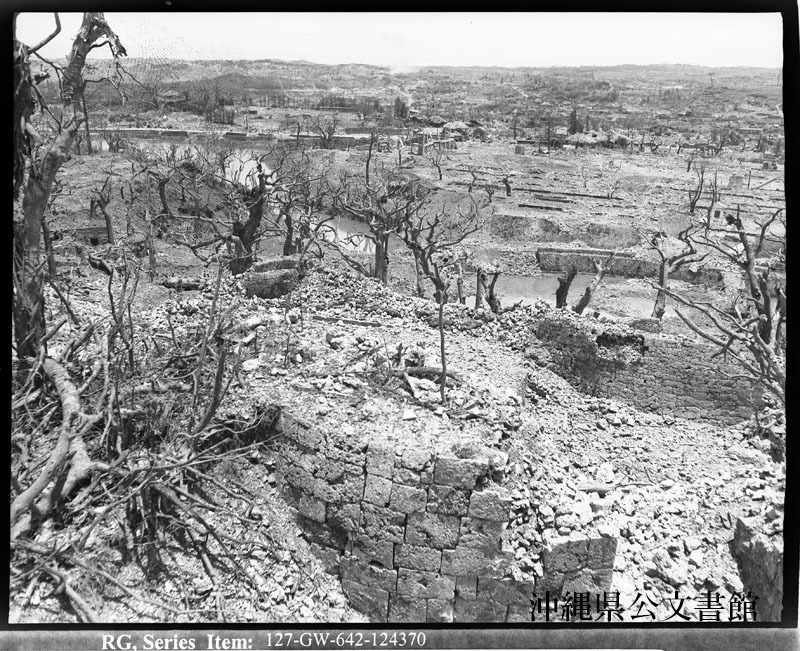 The battered trees are part of a grove which surrounded the castle. 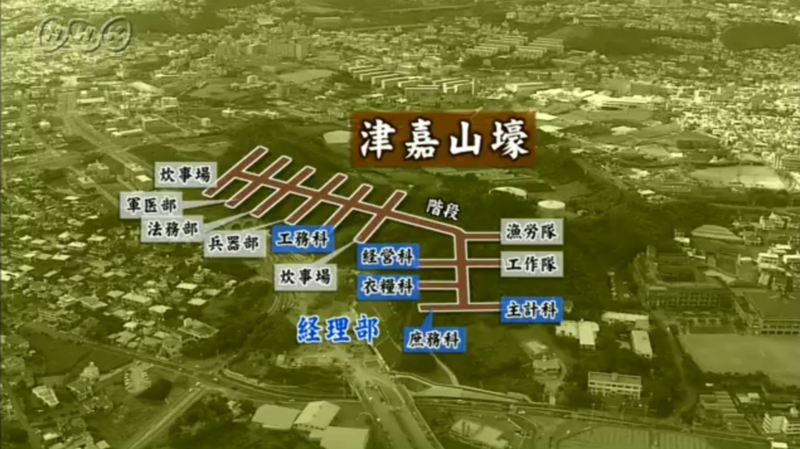 The castle was taken by units of the Fifth Marine Regiment. 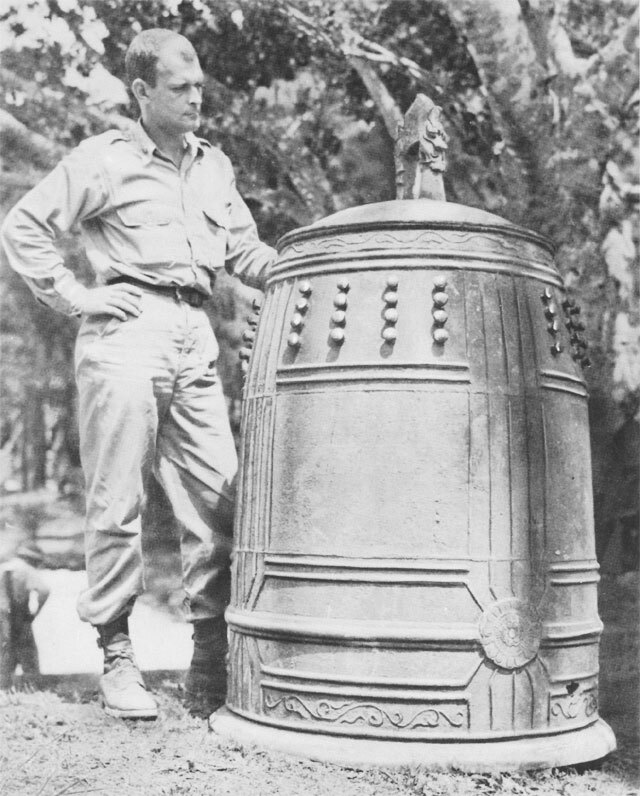 SHURI CASTLE BELL, with an American officer standing by. Bell is a companion to one brought to U.S. Naval Academy by Commodore Perry. 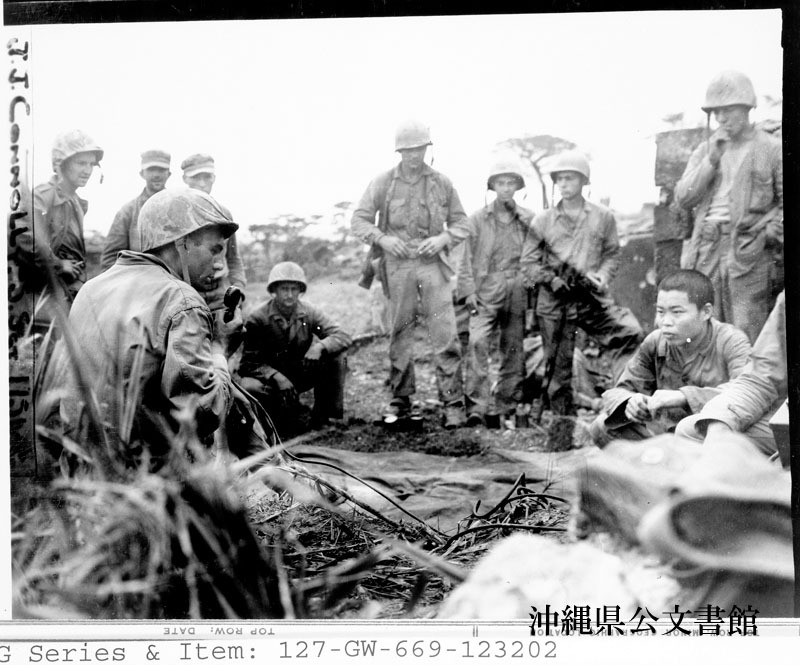 Marines of the 2nd Bn., 1st Reg. 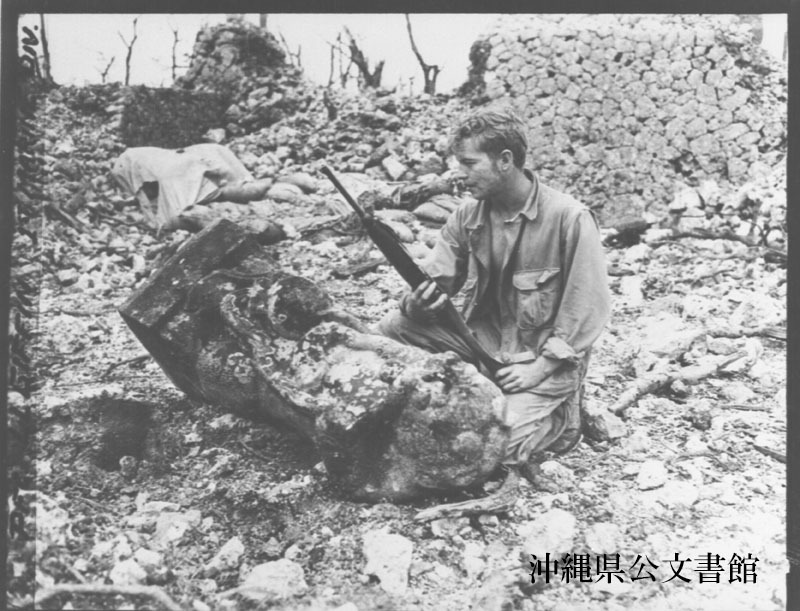 stops and inspects a Jap idol in the court-yard of Shuri Castle. 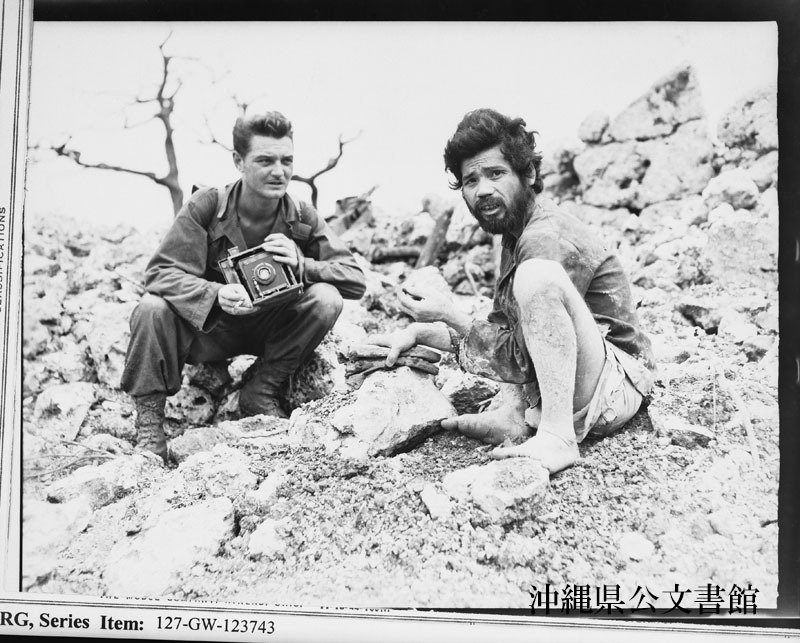 Photographer Giffin stops to talk to prisoner who was dug out of cave under Shuri Castle. 504th Antiaircraft Artillery Battalion Area. 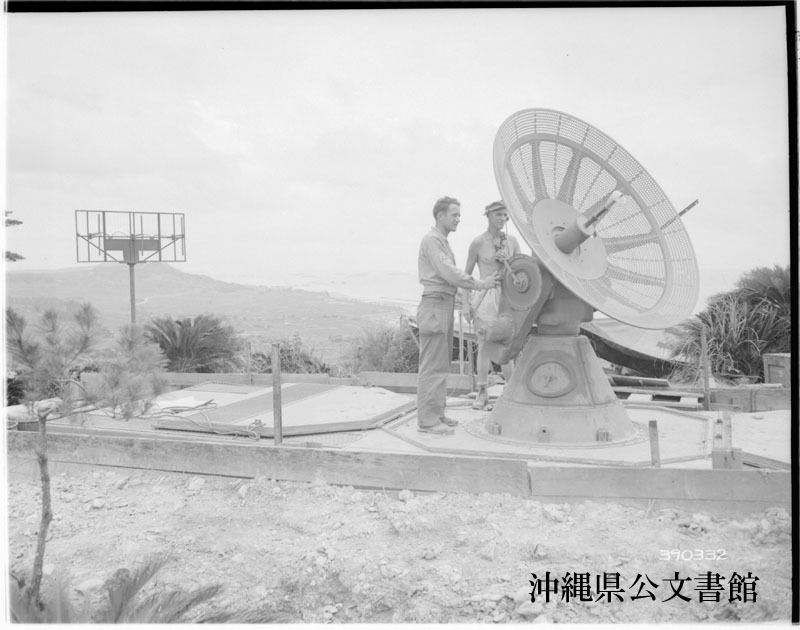 SCR 584 overlooking Nagagusuku Wan, new U. S. Fleat anchorage. 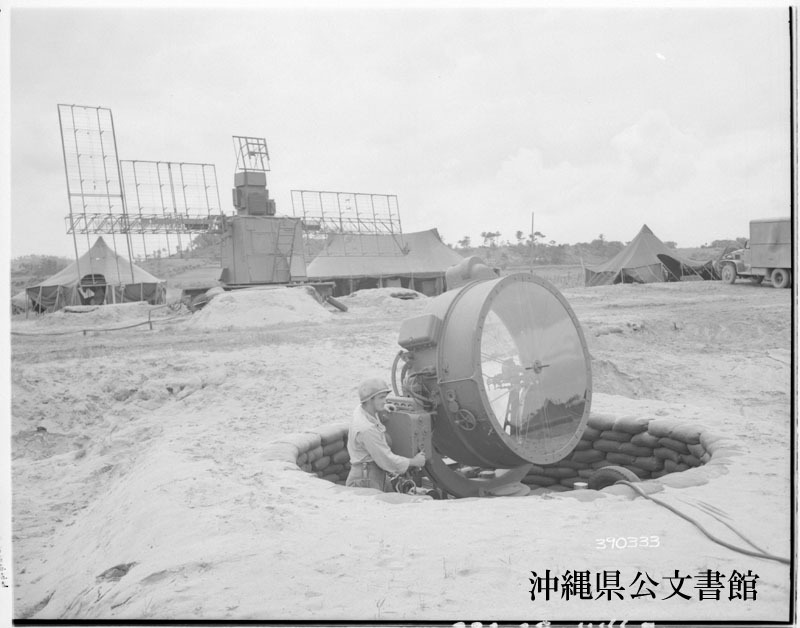 Battery ”C” 230th Antiaircraft Artillery Battalion, G. E. 42 searchlight; with SCR 268 B in background, both on outer ring protecting fleat anchorage in Nagagusuku Wan Harbor. 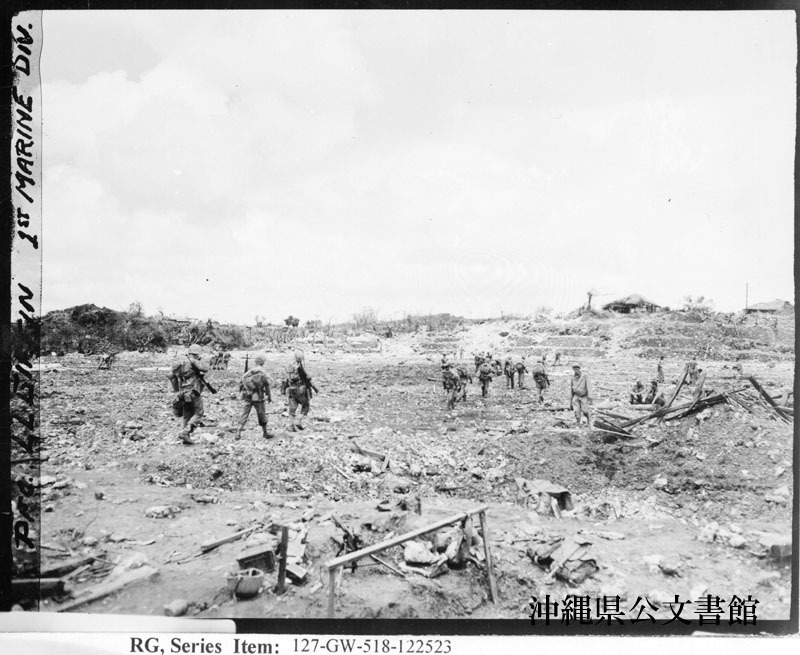 Scenes during the invasion of Okinawa. 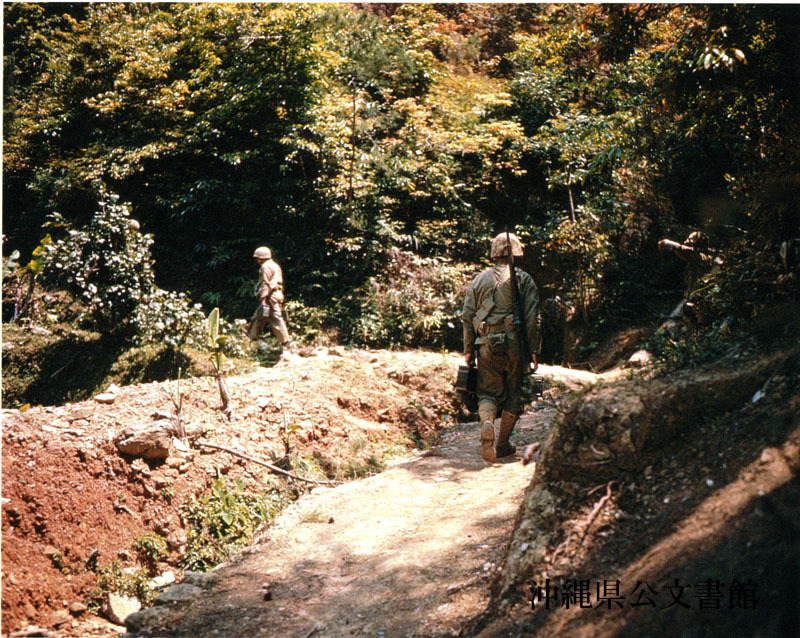 Infantryman, toting ammunition single file into the brush after the elusive Japs. 赤ん坊を背負う沖縄の子供 / Okinawan child carries baby.